A post for all the email marketers out there. It’s the start of a new year. Are you optimizing? Are you redesigning? Email is one area where it pays to never be satisfied. Your current results might be as good as you’d hoped. You might have had higher open and click through rates in 2015. But 2016 is a new year with new possibilities. And now is the time to be testing and learning more about your subscribers. The best way to prepare for the future might be to look at the past. Over the last week or two, I went back over all the emails I sent in 2015. What I wanted to know – how did the subject lines impact open and click through rates? You can do this too. All you need are the subject lines, the total emails sent, the opens and clicks for each email. List them all in one excel file and then group them in different ways. Does the length of the subject line impact results? What’s the ideal length of a subject line? Does putting a special offer in the subject line improve results? Does personalization improve open rates? Those are some of the questions I asked, and you can ask them too. You might have other questions you want to find the answers to. For one brand, shorter subject lines worked (less than 45 characters). But for another, the length of the subject line seemed to have no impact. Including the phrase “Special Offer” at the front of subject lines lifted open rates higher than actually including what the offer was, e.g. $100 off. Including the subscriber’s first name in the subject line led to better open and click-through rates. Adding special characters, like brackets or exclamation points, into the subject line actually hurt the performance of those emails. I’d be curious to see what you learn when you look at 2015 email results. 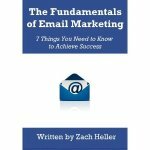 Then you can use those learnings to optimize your emails in 2016.